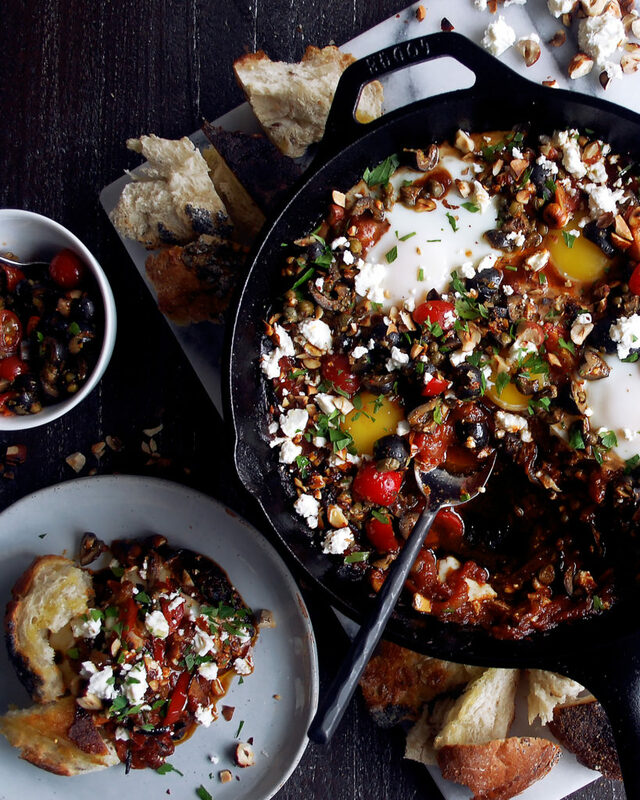 This shakshuka will be your new favorite savory breakfast. Any of you guys like me and could eat eggs just about any time of day? They’re so versatile and extremely satisfying. The key with eggs is to find exciting ways to make them extremely flavorful and as simple as possible. 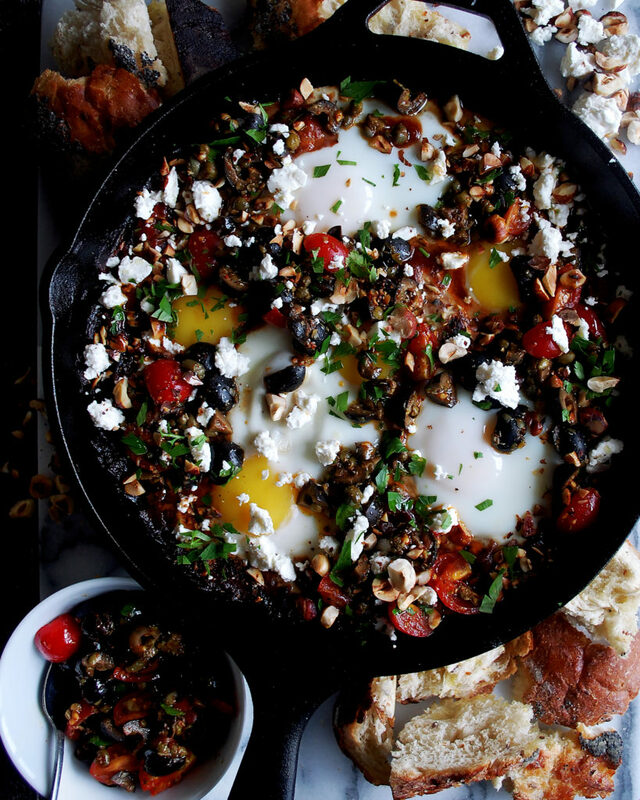 Enter this shakshuka. If you haven’t had shakshuka (and honestly, I had never really eaten it before), it is a North African/Middle Eastern style poached egg dish, where the eggs are cooked directly on top of a simmering spicy tomato sauce. This dish immediately screams flavor. The tomato sauce starts with a base of peppers, garlic, and intense spices like paprika and cumin. I add a little harissa powder, too, because I’ve really been loving it lately. Harissa is basically a blend of peppers and spices as well, so it sort of just adds an extra level of richness to the sauce. The sauce cooks in no time, allowing for just a few minutes to toss together the olive mixture, which I like to think of as a chunky olive tapenade. It has capers, parsley, and lemon…plus lots of olive oil. I even added some cherry tomatoes for more texture. The final step is to crack the eggs directly in the sauce. I mean how fun is that? 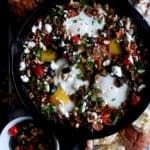 The shakshuka bakes in the oven just until the egg whites are set. I like to keep the yolks nice and runny, but that is totally up to you. Just bake the dish longer if you’d like. A shakshuka truly wouldn’t be complete without some good bread. I like to buy a really rustic, crusty loaf and just tear it apart into smaller pieces, warm it slightly in the oven while the eggs bake, and serve it right alongside the shakshuka. And I truly think it is perfect for any meal of the day. Enjoy! Heat a large cast-iron skillet over medium-high heat. Add enough olive oil to generously coat the bottom of the skillet. When the oil is hot, add the onions, red peppers, and chili peppers. Spread the vegetables in an even layer and let cook for about 5 minutes until slightly charred on one side. Stir the vegetables and let cook for about 5 more minutes until fully tender. Lower the heat to medium and stir in the garlic. Let cook for just a minute. Add the paprika, harissa, cumin, and coriander. Pour in the entire can of tomatoes (liquid included), using a wooden spoon to break up the whole tomatoes into chunky pieces. Lower the heat to medium-low and let the mixture simmer for about 10 minutes, stirring often. Season the sauce with salt to taste. Meanwhile, whisk together the extra virgin olive oil, harissa, lemon juice, and lemon zest in a large mixing bowl. Stir in the olives, capers, cherry tomatoes, and parsley. Set aside. Preheat the oven to 350°F. 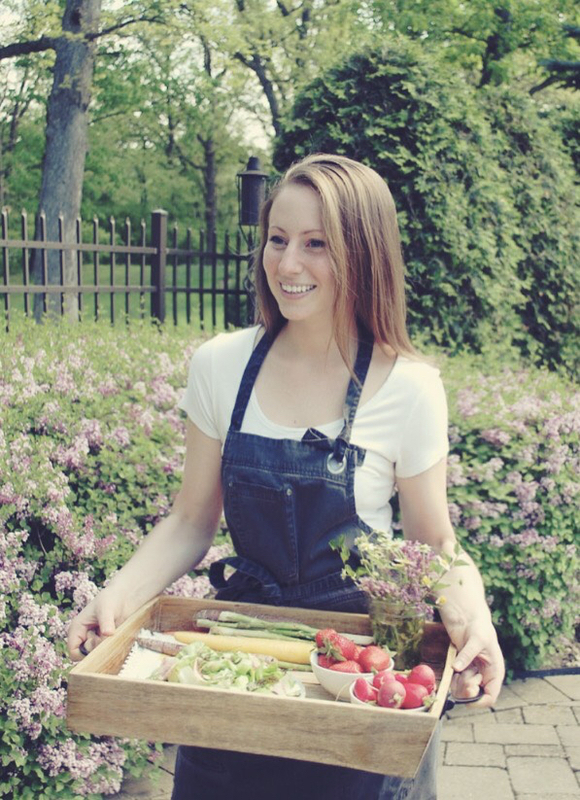 Once the tomato sauce has finished simmering, use a wooden spoon to make 6 “wells” in the sauce. Crack the eggs into each well. Season each egg with a little pinch of salt. Cover the skillet with a lid (or use a piece of foil) and transfer it to the oven. Bake for 5-7 minutes until the whites of the eggs are set and the yolks are still runny. You can fully cook the eggs as well, if that is your preference. 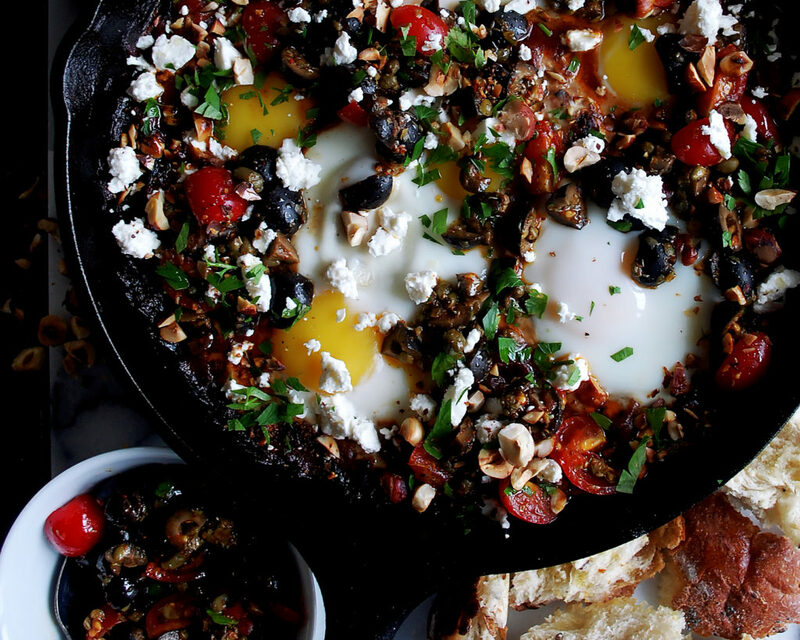 Garnish the shakshuka with the feta cheese and toasted hazelnuts. Serve with warm bread on the side.